Long hours and tough jobs aren’t a problem for the Poulan Pro PR2322 Gas Hedge Trimmer. With its powerful engine, dual-action blades, and anti-vibration technology, this hedge trimmer is great for those with a lot of vegetation and thick, overgrown hedges. But perhaps the best Poulan Pro PR2322 feature is its price. Cheaper than many of its competitors, this trimmer offers great features for a lower cost, making it a high-quality gas-powered trimmer for those who need to stick to a budget. Gas-powered hedge trimmers can be incredibly heavy (especially compared to electric hedge trimmers) and hard to use for long hours. Professional and non-professional landscapers can find that gas trimmers can be difficult to start, and noisy engines can mean complaints from neighbors or your HOA. What’s more, gas trimmers can be incredibly expensive, and are usually an investment for any homeowner or professional. If you find yourself complaining about all these problems and more, the Poulan Pro PR2322 might be a trimmer you should try. This hedge trimmer features a 23-cubic centimeter 2 cycle, full-crank engine, making it a high-powered machine great for tough jobs, and Poulan ensures a quick and easy start and a quieter engine than standard models on the market. 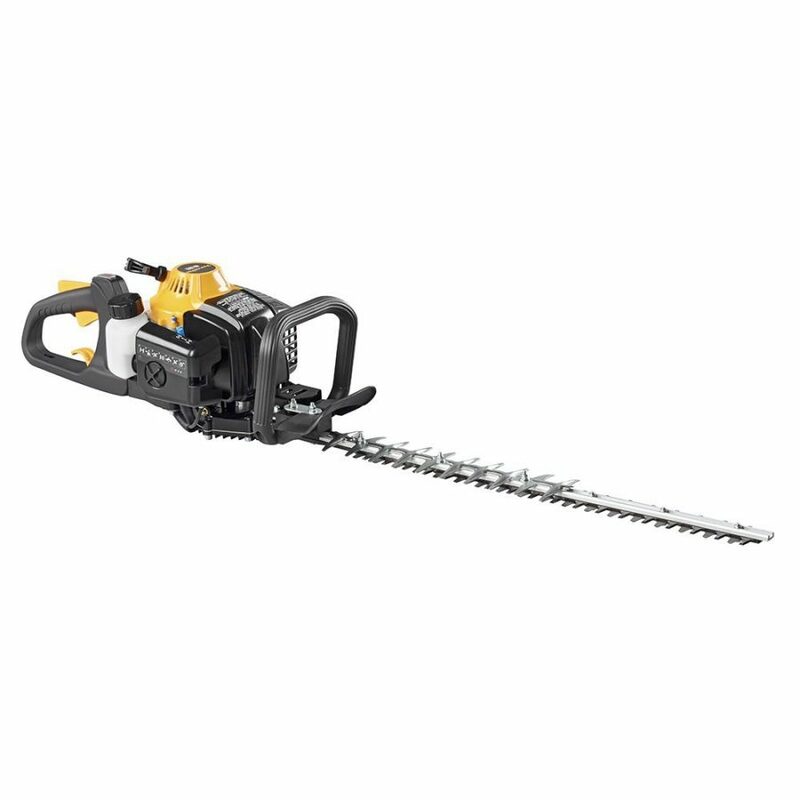 At a lower price than other, comparable gas trimmers, this seems like a trimmer perfect for a professional or non-professional landscaper who need a high-quality and rugged hedge trimmer on a budget. What I especially love about this hedge trimmer are its blades. 22-inch dual-action, stainless steel blades cut limbs up to 1-inch in diameter and cut a 22-inch swath, perfect for large, out of control hedges. For someone like me, with a lot of small fruit trees, blueberry bushes, topiaries, and pampas grasses that grow quickly and can be hard to maintain with just an electric trimmer (I can’t tell you how many times I’ve had a battery die on me while working) or shears, being able to chop through branches quickly saves me so much time. Plus, this hedge trimmers advanced anti-vibration technology means you’re not fighting to control it, lessening strain and fatigue and allowing you to cut more for longer. Low vibration also makes it much easier for someone my size to handle, making it much easier for me to make more precise cuts than I could with heavier models. The Poulan Pro PR2322 is also lightweight, weighing in at a little over 10 pounds when empty, and its rotating handle allows for greater comfort when cutting at odd angles and vertical surfaces. Some users complain that this trimmer is relatively large compared to others on the market, but considering just how powerful it is, its size doesn’t seem out of the ordinary. 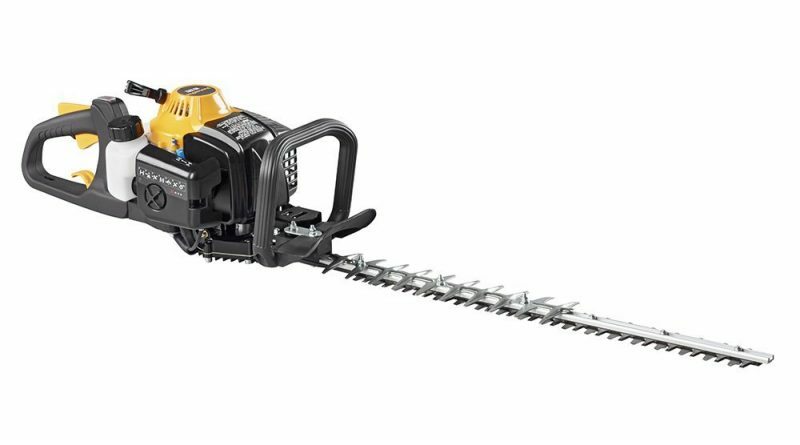 For a smaller person like me, this machine may be a bit awkward, especially when cutting in tight spaces, but for those who are fighting to reach taller branches and feel their current trimmer is awkward when cutting diagonally or horizontally, a hedge trimmer with a rotating handle might be a good thing to try. I’d definitely sacrifice a smaller size for a rotating handle and a lighter machine, especially for jobs that require me to cut vertically. 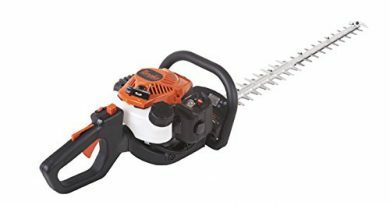 But for most people and for your average landscaping job, this hedge trimmer shouldn’t be too difficult to handle, and at such a low price, it seems like an overall great buy. If you’ve never used a gas-powered hedge trimmer before and are looking to buy your first, the Poulan Pro PR2322 may be a good first-buy. 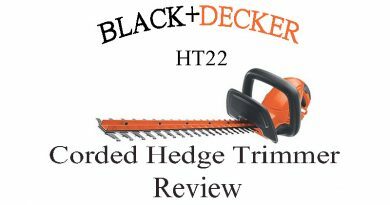 A low price and features that make it easy to handle make it a great hedge trimmer for those without much experience with gas-powered trimmers. The Poulan Pro PR2322’s high-powered, full-crank engine is great for those who need a powerful machine to cut through lots of vegetation without breaking down, which means it should last through years of hard work. 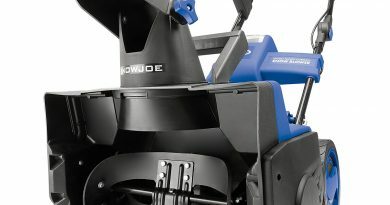 A rotating handle with comfort grip allows for greater control even when cutting at odd angles and means less strain when cutting vertically or diagonally. This trimmer’s anti-vibration technology also lessens strain, which means you can spend more time cutting with less fatigue. Dual-action, stainless steel blades are incredibly sharp and durable and won’t corrode as quickly as other blades. 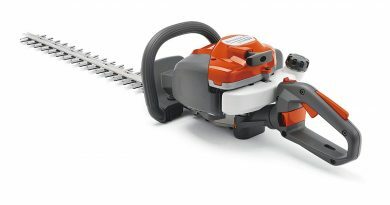 Users have stated that these blades, combined with the trimmer’s powerhouse engine make quick work of overgrown hedges, cutting easily through thick branches. The Poulan Pro PR2322’s light weight makes it easier to use for longer jobs, and its relatively quiet engine makes it a great choice for quieter neighborhoods. 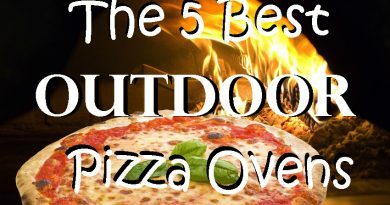 This makes it a great choice for those with close neighbors and a lot of vegetation to maintain. A 2-year consumer warranty isn’t as great as some of Poulan’s competitors. While this may be a turn off for some, users have said that it isn’t too difficult to find parts for this trimmer. Some users complain that the Poulan Pro PR2322 takes a long time to warm up compared to other trimmers, but this is a pretty minor complaint, especially considering how well it runs once it finishes warming up. Some users complain that this trimmer is rather large, which can make it difficult to use if you’re a smaller person, but its size isn’t too surprising given its power. Plus, the Poulan Pro PR2322’s light weight more than makes up for its bulk. The Poulan Pro PR2322 Gas Hedge Trimmer is a powerhouse of a hedge trimmer for a great price, and if you’ve never owned a gas-powered hedge trimmer before, this trimmer could be a great first buy. This machine has features that you would find in trimmers that cost upwards of 200 dollars, like its comfort-grip rotating handle, 23-cubic centimeter engine, and stainless-steel dual-action blades. While the warranty on this trimmer isn’t as good as warranties offered by other brands, this trimmer’s low price and rugged build mean that it is built to last, and other users haven’t had much trouble finding spare parts should they run into trouble.